It got down to -3.7C last night. Even the duck pond is mostly frozen over, leaving some very confused ducks waddling around. 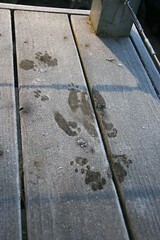 We've had some heavy frosts too, which resulted in some interesting observations, such as these tiny paw prints on the balcony. Whatever made these - possibly a cat or possum - it sat still long enough for the frost to melt, which can't be good for the bottom, no matter what species you are. I'm a little concerned about the effect of heavy frost on all our new native plant seedlings, and considering wrapping them in plastic blankets, but Phil is more of the 'survival of the fittest' view. That which does not freeze them solid only makes them stronger!